Update: I spent Sat/Sun/Mon afternoon on the trail and conditions are looking promising for recovery effort in a few weeks. I made it to the first rig on Saturday and the good news is its no where in sight, completely covered under 6-7 feet of snow. I did not attempt the second rig. Snow is still deep but melting fast, though we do have a storm coming in this weekend that will dump another 3-4' at 7K. A couple of built local rigs were out late Sunday afternoon and were able to stay on top putting down fresh tracks in the soft stuff so the base looks to be pretty solid. Half a dozen tank traps between staging area and Miller Lake. Biggest safety concern is the bridge just before staging area. I plan to get out again on my quad after this next storm to reassess but thinking Easter weekend or the weekend after (4/21-4/23) may be possibilities for recovery effort. Haven't yet been out on my quad after this last storm and may not get out until next week. Looks like we got about 2' of new snow and a bit more on the way this weekend. Shooting to push back a week and assemble a recovery crew for the weekend of 4/28-30 which will give me some time to nibble away at the trail before the big boys come in. Stay tuned. Operation Glacier Girl is a go! I finally got back on the trail yesterday after the rain and conditions look good for a recovery effort the weekend of 4/28-30. The new snow we got last week is ankle deep mush on top of the hard pack and melting fast. There's one spot on the access road where the asphalt is exposed but it's still mostly 5 to 6 feet deep to the staging area, 6 to 7 feet beyond that. The snow on the bridge is getting pretty skinny, just wide enough for my quad and remains my top safety concern. I plan to spend this week on the trail doing what I can clearing downed trees, smoothing out tank traps and packing down the snow. So far I've connected with 8 or 9 guys with built rigs and snow recovery experience willing to give it a go, so it looks like we have a good core group. Others are welcome too. If interested best way to reach me is to call or txt me, (415) 531-1441. I'll update and provide further details as we get closer. Thank you. My rig is sh!t in the snow or I would be there in a second. Good luck dude!!! Take lots of pics. Can you get snowmobiles in? There have been snowmobiles on the trail though they are winding thru the trees to bypass the obstacles. There are some snow bridges across the creeks but they're looking pretty thin. Yesterday (Saturday) Nick from Reno4x4 and I made it to the first rig on our tracked quads. We had hoped to uncover it for the recovery crew this coming weekend. We were encouraged to see that the snow on the trail has melted to the ground in many places but imoressed it's also 10-12 feet in others. 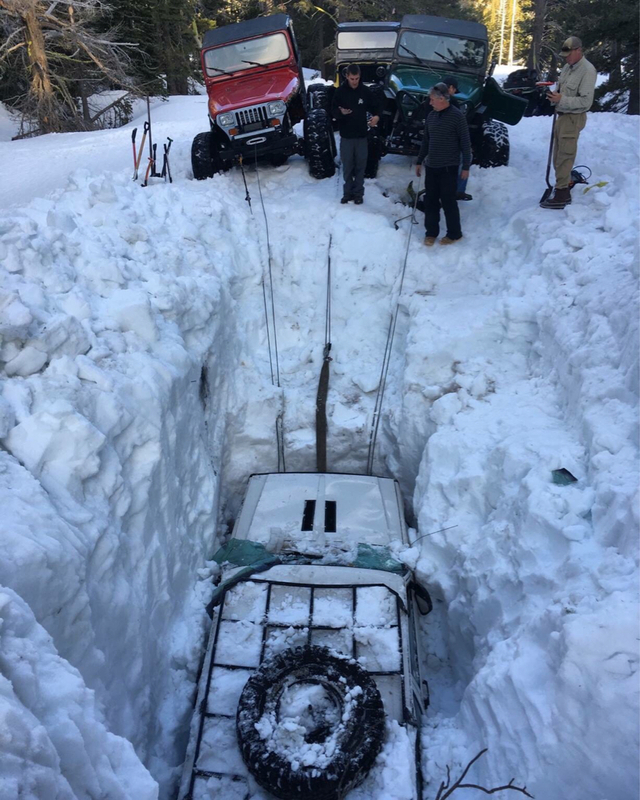 Unfortunately my son's rig, which is at approx 7,100 ft is completely buried in one of those 12' sections. So it goes. We tried to locate its exact position (I have it marked on GPS) but my 8' probe (plus the length of my arm) never touched it. We decided to leave it as it sits and not try to dig down to find it. To complicate matters there is a big lodge pole pine down across the trail just before that first rig, the base of which is 4' in diameter (Matt thank you for that scouting report). Nick and I bypased the big tree but we don't believe a 4x4 can do the same. it has to come out. I've communicated to most of the core group what we're up against and we've decided to modify our objective for next weekend. We will assemble our crew early Saturday and attempt to break trail to the first rig (or the big pine, if we can't get past it) and then return home that afternoon/evening. We will not plan to dig the first rig out or attempt to recover during this trip. Once we've established that we can reach it I will begin digging it out and reschedule a recovery. Some crew members may go out again Sunday but we do not plan to spend the night. I spent the week smoothing out the first couple of tank traps and creek crossings. Nick and I met a few rigs attempting to cross the first tank trap and I saw one make it through and back again. I don't know if anyone went further than that. There is one other big tree down immediately past the first creek crossing that will be a major obstacle but I belive that current conditions will allow us to drive over it. Nick cleared quite a few smaller trees blocking the trail to the first rig (thank you NIck!). For you woodsmen out there don't worry there's plenty more to do. I know others were out today I curious to get a report of how they fared. If you decide to go please be very cautious crossing the bridge to the staging area. It's getting pretty skinny and I'm worried someone will drop a tire off the side. Thank you. once its removed vehicles can get closer to the rig. if possible, clear it at last minute? I got this off Facebook is this your rig. That ramp looks to need less angle an more length. OGG Update: We made it to the first rig yesterday and got it uncovered, a 14 1/2 hour EPIC day on the trail with a fantastic group of guys. We far exceeded my expectations as I had hoped to just make tracks to the 1st rig, if that was even possible. Five rigs went over the berm at 8am, same group as we had in January with the addition of Tim's son Matt, plus me and Nick on our tracked quads. Two more local rigs caught up with us at McKinney Lake so in all we had 9 guys plus the two youngest brought their wives, nice to have the ladies on the trail, they were great sports (funny the older wives didn't want to go? Hmmm). It took us 6 hrs to get 5 miles in and 3 hrs to get out though on the way out we did meet a group of rigs taking a crack at the first tank trap. I had located my son's Cherokee (1st rig) late Friday afternoon, digging down 8' on a hunch and landing on the spare tire on the roof rack(!). We made it there around 2pm yesterday and almost immediately and without asking 9 guys had shovels in hand throwing snow like dogs digging up a bone. 4 hrs later we had the entire XJ uncovered, the hood open and Nick had Kenny's winch battery and a jump box wired up. Kenny put a shovel through the already broken windshield and crawled in over broken glass to unlatch the hood and turn the key. We were able to get the motor to turn over but it wasn't breathing, we suspect the tail pipe is crushed or clogged with snow (maybe a critter?). Scott, Tim and Matt rolled up and winched the Jeep forward a couple six inches and that seemed to help. But by that time it was getting late and we were all pretty sore and tired so we packed up and headed for home. As far as damage the XJ seems to be in pretty good shape considering the weight it was under. The roof is crushed down to the roll cage (glad we put that in! ), the windshield was busted, the mirrors are gone and the hood was resting on the valve cover (4.0 I6). The side window behind the drivers door gave way while digging out but there wasn't any snow inside the vehicle. We're regrouping now to determine next steps, possibly a recovery effort next weekend, but we'll see. Stay tuned. HUGE thank you to Nick, Jim, Scott, Tim, Matt, Kenny(! ), Mike and JJ. You guys absolutely rock. Do you have any more pictures? I would be willing to lend a hand if you need. I think renting or borrowing a snow blower might save a lot of shoveling to make a ramp. Lifting that rig out of that hole is going to be hard work. I have a snow blower. Kinda heavy and big but you could use it if ya like. Too bad no one knows one of those people that writes magazine articles... oh wait. This would be a good story. That pic is really getting around on social media. I've seen a ton of big pages reposting it. CHP Truckee even reposted it. Talking about how for some the warmer weather brings tans and for others it's getting your rig back. OGG update: Nick and I are trying to a assemble a recovery team for this coming Saturday. Scott, Jim and Kenny have family obligations and can't make it so I've reached out to those who've offered to help in the past on this forum and elsewhere. We've also blocked out the following Saturday when Scott and Kenny are available. If I've missed anyone with snow experience who's interested please contact me, (415) 531-1441. Thanks! I would be willing to help out but I don't have a trailer to get my Jeep up there, I'll see if I can find one and help out if possible. You're more than welcome to use mine I'll even deliver it to you! Are you in Sparks?